Reynaers stand at last year’s WDF ... well attended. Its parent company, the Belgium-based Reynaers Aluminium, launches such concepts every three years which are then replicated in its subsidiary markets at leading trade fairs. The latest design concept was unveiled earlier this year at the Bau Munich construction fair in Germany. This year the Middle East will be the first subsidiary market to view the new concept design at Reynaers Middle East’s stand at the Windows, Doors and Facades (WDF) 2017 trade fair, which will be held at the Dubai World Trade Centre in Dubai, UAE, in September (25 to 29). Many of Reynaers’ innovations will be integrated into the stand to resonate with the show’s theme, The Future of Building. “The façade industry’s latest signature showcase, Windows, Doors and Facades 2017 will be the most appropriate event to launch the new stand design,” said Ali Khalaf, managing director of Reynaers Middle East. The Bahrain-based firm is a regular participant in major trade shows such as the WDF, which provide an ideal platform to engage with customers and potential stakeholders keen to learn about its systems first hand. 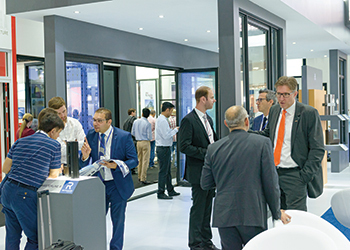 Buoyed by its success at WDF 2016, Reynaers Middle East will be at this year’s event where it will once again unveil some of its state-of-the-art advancements in windows, doors and facades. “Each year the company strives to present something unique and eye-catching – last year we presented a multi-level façade. This year, we are working towards incorporating highly sophisticated aluminium systems which will be a class apart,” said Khalaf. Some of the systems to be showcased include the door and window variants of the recently launched MasterLine 8. “MasterLine 8 offers designers exceptional architectural freedom with numerous design variants and scores particularly high in terms of energy-efficiency. Special attention was given to the manufacturing and installation of the variants, which provide an optimised production process that includes a time- and cost-efficient assembly and simplified installation of the finished elements,” he explained. To further enhance smart manufacturing, Reynaers introduced ReynaFlow, its dedicated software package, designed to optimise, control and improve the production process, Khalaf added. Visitors to its stand will also have the opportunity to see numerous other door, window, façade, and bespoke solutions, which feature innovative enhancements in terms of insulation, fireproofing, air and wind resistance, ventilation, and water drainage solutions. “New approaches to opening up space through the use of large glass surfaces, often without fixed corner elements, yet without loss in insulation values, are featured in several of the products on display,” he says. The Hi-Finity door, which features an ultra-slim design and offers an infinite view, will be in the spotlight. This system is burglar-resistant, conforming to Class RC2. Also displayed will be the CF 77 folding doors series, which offers optimum space utilisation while maximising on daylight. The standalone solution, which provides high insulation values, comprises new profiles, accessories and insulation technologies that have specifically been designed for folding systems. Other systems to be displayed include the sliding series CP 130 and CP 155-LS, and the windows and doors series CS 77. Since its launch in 2004, Reynaers Middle East has witnessed steady growth and has supplied to projects within the GCC and other Arab countries. In Bahrain, its latest projects include the prestigious Essence of Dilmunia, Four Seasons Hotel, YBA Kanoo Tower, Tala Island, Platinum Tower, and Era Tower. The UAE is among Reynaers’ most active markets with several new projects undertaken particularly in the health and education sectors such as the SKMC Dialysis Clinic, Gayathi Hospital, Al Falah Ambulatory Centre, Al Sila Hospital and Swiss International Scientific School. The Ferrari Theme Park, Presidential Palace, Cleveland Clinic, Ritz Carlton Hotel, Etihad terminal, Bayside Residence and Executive Heights are its UAE iconic projects. Its projects in Qatar include the latest Hermes Development which is under execution while in Saudi Arabia its systems have been used for the Al Khair Tower, Bay La Sun hotel in King Abdullah Economic City (KAEC) and Bamaroof Tower. In line with its strategy to get closer to its customers, Reynaers Middle East has opened two additional branches in the UAE and Egypt, and set up a warehouse and factory in Saudi Arabia. Reynaers Aluminium provides innovative and sustainable architectural aluminium solutions including window and door systems, curtain-walling, sliding systems, sun screening, conservatories, skylights, screens and systems to incorporate blinds and ventilation grids. Established in 1965, the company has offices in more than 30 countries worldwide. Reynaers will be at Stand 7A281 at WDF.